Leonardo DiCaprio is many things: a talented actor, a passionate environmentalist, and an all-around smooth customer. He's also a pretty good Jack Nicholson impressionist. At least he can do the creepy Nicholson eyebrow look. 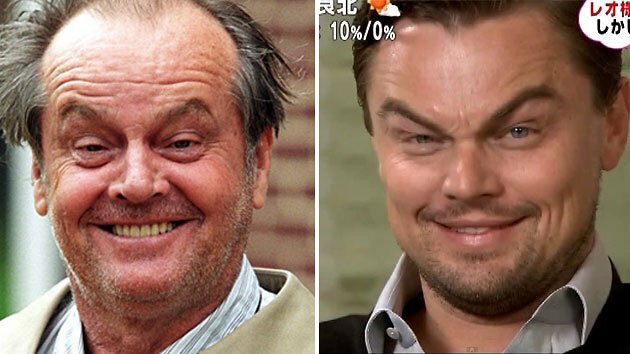 On a Japanese talk show where he was promoting "Django Unchained," DiCaprio indulged the host and studio audience with his previously unknown gift for channeling his "The Departed" co-star. While on the talk show, DiCaprio also discussed the hand gash he got while filming the Oscar-winning Quentin Tarantino film as well as his taste in women, saying sense of humor and cleverness are at the top of his list when it comes to selecting dates. It must be said: This television segment is hilariously lost in translation. Why doesn't Barbara Walters use cutesie video graphics on her celebrity interview shows?